Blurb Description: In a land without magic, where the king rules with an iron hand, an assassin is summoned to the castle. She comes not to kill the king, but to win her freedom. If she defeats twenty-three killers, thieves, and warriors in a competition, she is released from prison to serve as the king's champion. Her name is Celaena Sardothien. "My name is Celaena Sardothien, but it makes no difference if my name is Celaena or Lillian, because I'd still beat you, no matter what you call me." She smiled at him as she stood. He just stared up at her, his bloody nose leaking down the side of his cheek. Brutally trained as an assassin from the tender age of eight, sent to a death camp at the age of sixteen, out to play a dangerous game to become the King's Champion a year later. She is Ardalan's Assassin, the most notorious of the Assassin's Guild, a girl; a child thrust into the word of darkness, evil and destruction. From starving, freezing, and being whipped, Celaena Sardothien is transported, to be the crown prince's champion at a competition for the country's best assassin to become the King's. Except, nobody can know that the one everyone feared only a year ago, is back out of the place she was supposed to die in. And so, Lady Lillian, a jewel thief with daddy issues is born. But for a seventeen year old, a glass castle with the most beautiful gowns, competitors that view her as nothing, a distrusting Captain of the Guard, the Princess from the nation rebelling against the King's rule and the charismatic and ridiculously smart crown prince himself, all in between brutal murders and a competition filled with assassins, soldiers and thieves, things are about to interesting and VERY complicated. 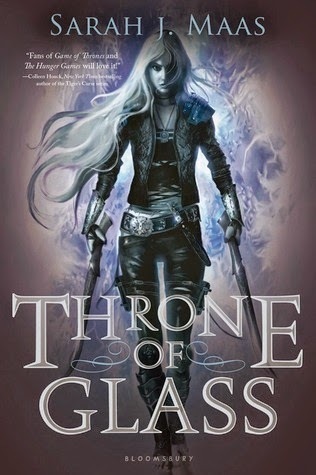 Throne of Glass is simply put, a BRILLIANT book – and I can't wait for book two to reach me. I don't have much more to say, except that this book will give you all you want and more. As the plot thickens, romance lights up the air, other dimensions are opened and ancient magic is brought to life, you will be left breathless and spell bound. I love this series! Celaena is so amazing and Chaol is a sweetheart:) And the sequel is even better! I've heard such great things about this book I think it's time I finally started reading it before the sequel arrives.